Collection-number: Harvard Museum of Comparative Zoology, Cat. No. MCZ-27704. The Holotype is a mature female of 27mm standard length. The specimen was collected by the US Amercian botanist Edward Palmer in a spring or endorheic stream near Parras. This female fish which was on S. Garmans hand (1895), and that he named Characodon lateralis, was labeled by him with: "originally discovered in Central America; here described from Parras, Coahuila, Mexico". Concerning the type location, see the following chapter. The type location of Characodon garmani was given by Jordan and Evermann (1898) as "Parras, Coahuila, Mexico". The only reference for this area as home to a Characodon species came from Samuel Garman three years before the description (see the previous chapter), but there are severe doubts about this location. We know through the Monography from Samuel Garman about the Cyprinodontiformes (The Cyprinodonts, 1895), that Palmers collection dates back to the year 1880. 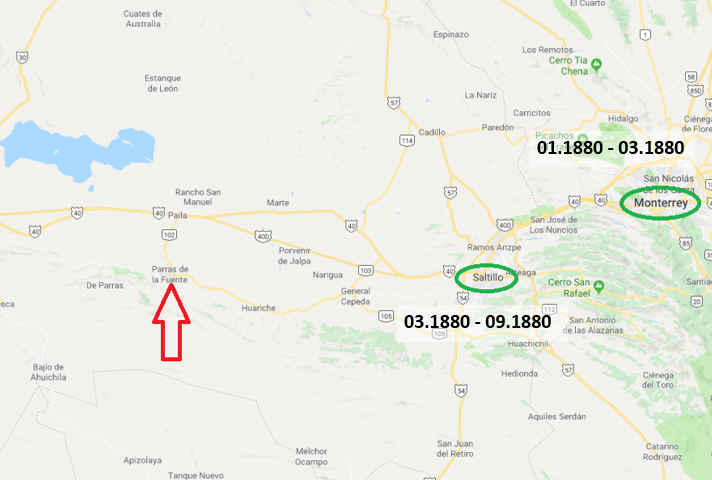 Marvin D. Jeter, who edited "Edward Palmer's Arkansaw Mounds" (1990), was able to limit the period in Coahuila from early 1880 to September, with a changing residence from Monterrey to Saltillo by mid-March (see the map below). In September, he returned to Texas and from there to Cambridge, Massachusetts, in mid-November. In 1881 then, Garman described some new (Cyprinodon latifasciatus, Stypodon signifer) and little known fish from this collection, and located them geographically the following way: "The majority are from small streams or springs flowing into the Lago de Muerte or the Lago de Parras, in the southwestern part of the State of Coahuila, Mexico. These lakes or lagoons are said to be completely isolated. They are marked so on the latest maps of this portion of the country. The list is compiled from a collection made for the Museum by Dr. Edward Palmer." At this time, only nine specimens of Characodon lateralis were known, so one thought to expect, that Garman would mention the fact, that Palmer finally found this (little known) fish from a so far imprecise origin (namely Central America), but he didn't. The Rainbow Goodeid is not mentioned in this paper, which is a big surprise. So it seems natural, that it was originally not part of Palmers collection from locations near Parras, and it is not even sure, if Palmer collected this fish at all, as his Durango journey happened only the year after Garmans paper, in 1896. The question remains: who collected this fish, when, and where? But there is actually a study in cooperation with the GWG in process (Piller et al.) to solve the phylogenetic relationship of all known Characodon populations (including C. garmani), so until this study isn't finished, it is better to keep it as it is to prevent anymore confusion. We should however expect future changes (see also Characodon lateralis). The species is named for Samuel Garman in recognition of his valuable studies on Cyprinodontiformes. The Parras Characodon was endemic to the Mexican federal state of Coahuila, now extinct, but was formerly found in the Parras Valley (Almada-Villela, 1990). This is an endorheic valley and all the fish habitats there were modified by the end of the 19th century and stocked in the 20th century with exotic fish before any of the native species could be studied. Many inconclusive attempts have been made to find Characodon garmani (and other endemic fish of the Parras valley) over the last decades, so it is regarded extinct. No subpopulations are distinguished. In Characodon garmani, we use the single ESU Chrga1 for the single specimen we know, characterizing the complete collection of this extinct species. 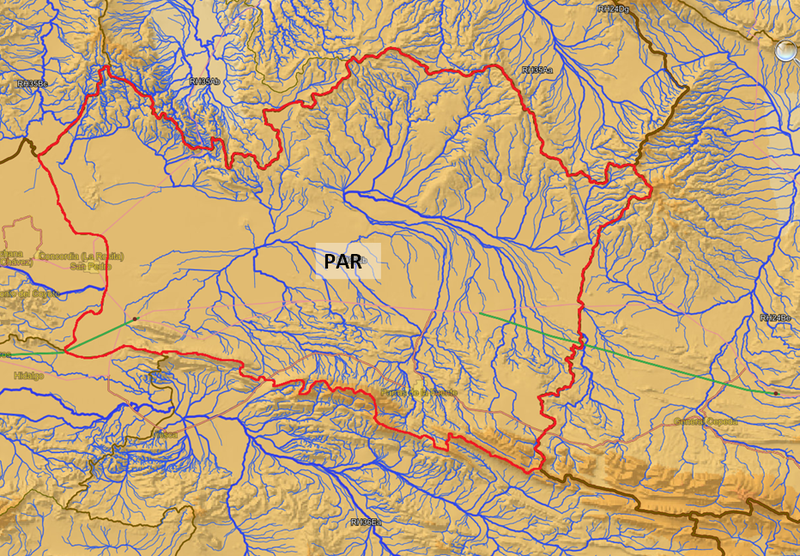 The Parras Characodon is supposed to have inhabited the endorheic Parras infrabasin (PAR) of the Parras-Viesco subbasin, Torreón basin. Conservation status and population trends of Mexican Goodeids (Lyons, 2011): extinct/No records since 1890s: "This species is known from only a single female individual, collected from the Parras Valley in Coahuila prior to 1895 (Fitzsimons, 1972; Smith and Miller, 1986; Miller et al., 2005). This valley has no outlet to the sea, and the habitat there was heavily modified before C. garmani could be studied or protected in captivity. Many attempts have been made to find the species over the last 60 years with no success, and it is clearly extinct (Miller et al., 1989)." Characodon garmani inhabited springs near Parras de la Fuente in the federal state of Coahuila. The springs disappeared by human influences long before any information about the habitat structure could be obtained. Nothing is known about this fish, not even if it really existed as all the information about the origin of the fish is extremely doubtful (see also the chapter about the Terra Typica). When it really was a valid species, then it had probably a similar life history to Characodon lateralis and audax. Nothing is known about its diet, but its feeding habits were probably the same as of its congeners. The maximum standard length is unknown. The colouration is only known from a single female in preservation. Jordan and Evermann described it as "olive to reddish brown, with scattered small spots of darker on the back, a darker band with or without spots of dark along the flank, more distinct posteriorly. Fins with fine dots of dark colour". No sexual dimorphism is known, but there are also no doubts, that it was similar to its congeners. Brian Kabbes, Netherlands, was in 2000 in a small town, 7km south of the city of Durango, also named Parras del Fuente. Near this town, there were in former times locations with Characodon (audax) populations, so maybe it was just a confusion, in which federal state the town next to the type locality was located. The Parras valley in Coahuila is some three hundred kilometres northeast of the Río Mezquital-valley. It is a desert area enclaved in the Chihuahua desert, far away from any locality where Goodeids live. Concerning further speculations about the origin of the Holotype, see also the chapter about the Terra typica. Concerning distribution patterns of fish within the ríos Nazas and Mezquital, without wanting to predicate anything and excluding all endemic species (and therefore extinct species) of the type location of Characodon garmani, we find only a few species inhabiting both river drainages. These are the Cyprinids Codoma ornata and Campostoma ornatum, and the Percid Etheostoma pottsi. Both genera have their closest relatives in the north of México (Neartic realm), with the tendency to migrate southwards. On the other hand, we find some genera and species in the Río Nazas basin, but not in the Río Mezquital. These are two species from the genus Cyprinella, one from Gila and one from Notropis (all Cyprinids), as well as Catostomus nebuliferus and Ictiobus niger, both Catostomidae. None of these genera can be found south of the Río Nazas. In the Río Mezquital, but not in the Río Nazas, we find (besides Characodon audax and lateralis) the following species: Hybobsis aulidion (Cyprinidae), Gobiesox fluviatilis (Gobiesocidae), Menidia mezquital (Atherinopsidae) and Moxostoma austrinum (Catostomidae). 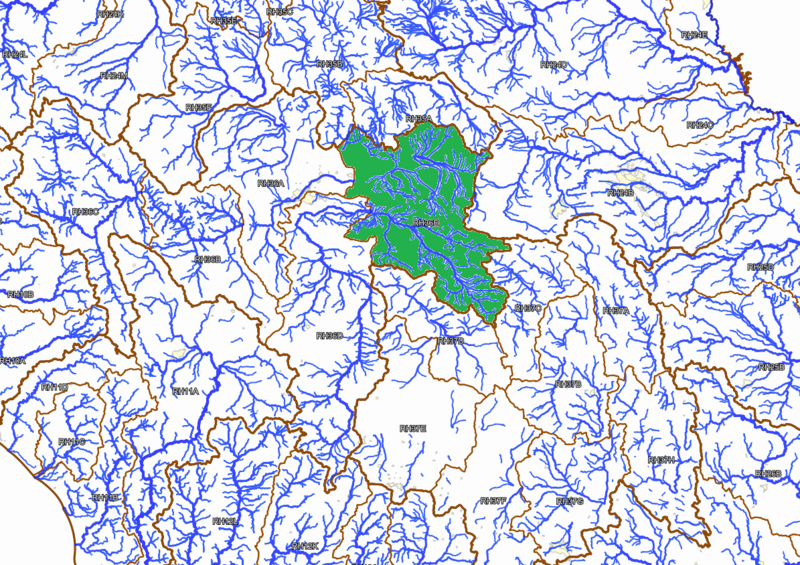 Without Moxostoma (which is a genus with a not fully resolved taxonomy), all species and genera have its origin in the south (Neotropical realm) and are reaching the Río Mezquital as its northernmost geographic range. The only genus definitively living in both ríos with two different species is Cyprinodon (Cyprinodontidae) with the species Cyprinodon meeki in the Río Mezquital and Cyprinodon nazas in the Río Nazas. This genus reaches the Río Mezquital in the area of 27. de Noviembre. The conclusion of this is, that Characodon and Cyprinodon would be the only genera with a distribution range with relatives in the ríos Mezquital and Nazas drainages. On the other hand, here some lines from James Langhammer to this topic: "The waters above the Falls can still today all be connected to one another during heavy raining seasons - and historically made a continuum northward to the basin that housed Characodon garmani. The historical distribution was a continuous channel that probably flowed year-round. The headwaters originated near the Los Pinos home range, flowed down to Guadalupe Aguilera and Chupaderos, then to the location where presently the High Falls pirated the system onto the Mezquital. Prior to the piracy the system turned northward and flowed to the confluence where El Toboso, Abraham Gonzales and 27 de Noviembre join it, and then flowed north to the presumed habitat of Characodon garmani and then merged with the boundary river (Río Grande del Norte) between the USA and México. This is fully documented in a hard-to-find paper on the distribution of Garter Snakes."